Key difference: Currently, the two most commonly used inks are pigment inks and dye inks. Dye inks are more common, whereas pigment dyes have recently gained popularity. Comparatively, pigment inks are expensive, more color-fast, and less consistent in color and range. Ink is a liquid that can be used to color a surface in order to produce an image, text, or design. It can be used via a pen, brush, quill, or in the modern form of printing. There are various inks available made from different ingredients, including solvents, pigments, dyes, resins, lubricants, solubilizers, surfactants, particulate matter, fluorescers, and other materials. Currently, the two most commonly used inks are pigment inks and dye inks. Dye inks are more common, whereas pigment dyes have recently gained popularity. Comparatively, pigment inks are expensive, more color-fast, and less consistent in color and range. There are various reasons for this. Pigments inks are essentially pigment suspended in ink to provide color. Pigments are solid, opaque particles made by linking together pigment molecules in crystalline structures. The source and type of pigment directly affect hue, saturation, and lightness of the ink. Dye-based inks, on the other hand, are various dyes dissolved in a liquid, which gets absorbed into the paper tinting the paper with the dye. These are generally stronger than pigment-based inks. They are also capable of producing more color of a given density per unit of mass, i.e. less ink can be spread over large areas of paper. As dye-based inks are absorbed into the paper, they have a tendency to bleed at the edges of an image. The pigments inks do not have this problem as the pigments stick to the surface of the paper. These inks have a much less chance of bleeding. Dye-based inks also prone to fading or shifts in color after a period of time. If the image has exposure to sunlight for periods of time, the image is likely to appear faded. Pigments inks do not have this problem. Dye-based inks are also water soluble; hence if the paper comes into contact with even a few drops of water, the image might bleed or smear. Again, pigments inks are less prone to this as they are not completely water soluble. 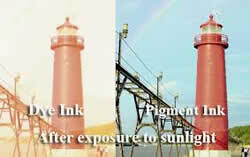 Also, pigments inks are more stable than dye-based inks making the images last longer. However, this also depends on the quality of the inks used. High quality pigments inks can last more than 200 years on some paper types under ideal lighting and framing conditions. Whereas, dye-based inks can have a life from 10 years to even 100 years under ideal conditions. However, for most print work this point is not as nearly important, especially considering that pigment inks are generally more expensive than dye inks. Pigment inks also tend to have a lower brightness than dye inks. Moreover, pigment inks suffer from a condition known as metameric failure, due to which they tend to refract light as different angles. This leads to certain colors appear like other colors, depending at which angle the viewer looks at the image. Also, as stated before pigment inks are not available in a broad color range like dye inks. Furthermore, dye inks have an added advantage that they are better able to interact with other ink ingredients, such as optical brighteners and color-enhancing agents which aim to increase the intensity and appearance of the dyes. Hence, dye inks are more versatile than pigment inks. Also, one should note that pigments inks should not be used with dye ink-based printers and vice versa. This is mainly because the inks have different viscosities and the thicker pigment ink will clog the dye ink-based printer. The dye ink, on the other hand, will flow excessively from the pigment ink printer leading to image bleeding.